Erect stems that are triangular in shape. Can grow to 30 inches tall with .5 inch wide blades. Leaves are yellow-green in color in groups of three. Reproduces from small pea sized tubers. Prefers damp to wet soils. The yellow variety has yellow seed heads, while the purple variety has purple seed heads. Yellow and purple nutsedge are the two primary species found in lawns. They are often mistaken for grass, but have very noticeable differences making them easy to identify. Both types are perennials, but in cold winters can behave like annuals. The name comes from the tubers (or "nutlets") it produces underground. The tubers are small organs that are used for energy storage and plant reproduction. The tubers develop along short rhizomes that grow just under the soil surface. These nutlets are the only part of the plant that survives cold winters. In frozen ground, every part of the plant, including the roots and rhizomes die. Only the tuber survives. This is where the plant behaves more like an annual than a perennial. The following year as temperatures warm, the tubers will sprout and begin new growth. It has a shallow fibrous root system that prefers damp to wet soil. It will often start in poorly drained soils. Years with greater rainfall tend to be more favorable for nutsedge. Both varieties have triangular shaped stems that grow upright and do not lay prostrate like grass. If left unmowed, they can reach 30 inches in height. If you were to cut the stem in half, you would clearly notice the triangular shape. This is in contrast to most other grasses that have round stems. Additionally, the seed head of yellow nutsedge is yellow, while the seed head of purple nutsedge is purple. However, if you mow regularly, you will probably never see the seed heads. The leaves are produced in groups of three. The leaves of yellow nutsedge taper to a point gradually over the length of the blade. The blades of the purple variety taper abruptly near the tip. Lower leaves on the stem are the longest and arch outward with the tip touching the ground. The leaves farther up on the stem are shorter, becoming more upright in growth. The leaves have a waxy coating and has a prominent midrib down the center of the blade. When plants reach maturity they will produce seed heads that have a star shaped pattern. However, the seed is not very viable. Only about 5 percent of the seed germinate, even in the best of conditions. Yellow Nutsedge will produce a small tuber, the size of a baby pea, at the end of a rhizome. Purple nutsedge will produce several tubers in a row along a single rhizome. These tubers grow within a few inches of the mother plant and are the primary method of plant reproduction. Each tuber can produce up to 3 new plants. As a result, you will often see plants growing in patches and will slowly spread outward. Tubers will sprout as soil temperatures remain above 60 degrees and will continue to sprout throughout the summer. As each tuber sprouts, it develops into an individual plant with its own root and rhizome system. With each new plant, there will be even more tubers. While both are difficult to control, purple nutsedge can be more aggressive and harder to control due to the greater tuber production. Studies have shown that these tubers will produce new plants even when buried 8 or more inches into the soil. This means that roto-tilling them into the soil will not kill the tubers, but could actually make things worse. Like many other weeds, these plants are opportunistic, taking advantage of weaknesses in the lawn. The good things is that nutsedge does not compete well with a thick lawn. Therefore, producing a thick turf is the best defense against these and other weeds. If you do find this weed growing in your lawn, it is best controlled when it is young. If you pull it up before tuber development occurs, you can probably control it. However, larger plants will usually break off at ground surface leaving the roots and tubers in place. Even if you were able to pull up larger plants, roots and all, the tubers are most likely to remain in the soil. Digging becomes an option, but only if you have gotten the entire root and all tubers. 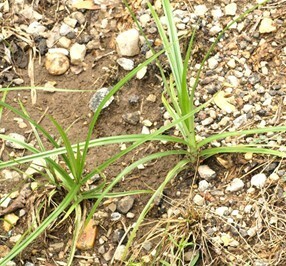 Since nutsedge prefers damp or wet soils, it is frequently seen growing in poor drainage areas. If this is occurring in your lawn, it is important to correct the drainage problems. You may need to add soil to raise a low area, redirect runoff, etc. The key is to correct whatever is allowing the soil to remain excessively damp. Nutsedge cannot be controlled by traditional broadleaf weed herbicides. Since it is not a grass, but a member of the sedge family, it requires a different approach. Make sure the herbicide lists nutsedge on the label as one of the weeds it will control. Use these products when plants are still young for the best results. You will probably have unsatisfactory results if you spray late in the season. Once the plants have hardened, they are less susceptible to herbicides and more difficult to control. Due to its waxy surface it is best to mix a "sticker/spreader" into the solution. You will find more information on Sticker/Spreaders below. You can also use a non-selective herbicide such as glyphosate. Glyphosate is the active chemical in Round-Up, Rodeo, and similar grass and weed killers. Keep in mind that non-selective herbicides will kill all the grass it touches and not just weeds. If you are unsure about what to use in your area, call your local county extension office. They should be familiar with the laws and products that work best where you live. Since nutsedge has a waxy surface, the herbicide will roll off. The addition of a sticker/spreader will keep the herbicide on the plant and help with absorption. Some manufacturers will add a sticker/spreader to the formula and will be listed on the ingredients. If it is not already added, you can buy it in a small bottle and simply add the correct amount stated on the label. It can be poured directly into the sprayer along with the solution. Be sure to mix thoroughly. Always read the labels and follow the directions carefully. Be sure to look at the Using Herbicides Safely Page for detailed information on how to safely handle, use and store herbicides and other chemicals. There is information on everything from protective clothing to how to read a label.